"All is quiet in my house, nothing stirs ... not even a mouse." Only the quiet hum of the aquarium filter can be heard. I am the only one awake, playing with the little "Ded Maroz" (Father Frost) figure under our New Year's "yolachka" (Christmas Tree) trying to conceal the excitement bubbling out of my 40-pound body for the night ahead. It's the only night when even children are allowed to stay up with the adults and enjoy the festivities of the coming year. It's December 31, 1988 on a usually snowy day in my homeland of Russia. The streets are bustling with people getting last minute treats for their elaborate New Year's Eve feasts and traffic roars down busy streets as people rush home for their naps. That is precisely what was happening at my house. All the adults were fast asleep getting their much needed sleep in preparation for a night filled with laughter, drinking and celebration. Much like our dinners, New Year's Eve has become a marathon of food and drink. Memories, tales and shots are shared much into the early morning, until all the crumbs from the dining room tables are cleared and replaced with steaming cups of tea and coffee and plates of freshly made omelets with butter. After a 12-hour marathon, the survivors return to their homes to freshen themselves up for Day 2 of celebration: New Year's Day; a repeat of Day 1, with more memories, more tales, more food – more vodka. In Russia, New Year's Eve is as big as Christmas is in the states. Christmas, and God forbid Chanukah, cannot be found on any calendar. Instead, New Year's Eve is lavishly celebrated. Houses proudly display their sparkling and tinsel-wrapped yolachkas in their windows. Everyone gives each other presents and goes to see New Year's Eve plays featuring our non-controversial version of Santa Claus, Ded Maroz, and his usually much younger, sexier, scantily clad assistant, "Snegurachka." I still remember our beautiful "yolachka," a real tree that smelled of pine cones and frost. We had the most gorgeous ornaments that were hand-made and each one had its own personality. My dad and I would decorate the tree together, and my favorite part was spreading the cotton "snow" at the tree’s base. We laid "Ded Maroz" and "Snegurachka" figurines into the "snow" along with tinsel, toy trains, presents and all the other ornaments that couldn’t fit onto the tree. Countless hours were spent playing under that tree, wondering which presents were for me, dreading the moment we would have to put the tree away. On New Year's Eve lots was to be done and everyone somehow had a role in the success of the evening. My brother was typically outside having snowball fights with his friends. My babushka (please refer to this post for a Russian lesson) would usually be in the dining room laying out the first course of appetizers on our crisp white tablecloths. And while she was clearing off any remaining pieces of lint off of the freshly pressed cloths, I would sneak into the kitchen to get a lick of some of the fallen cream off of her famous waffle tort. My mom would race around putting her last touches on her lipstick and her Napoleon cake. I would run right behind her, reluctant to miss any of the New Year's preparation. My dad, always the last to wake up from his nap, would walk around lazily trying to find his missing tie, annoying my mother with his constant request for help to find yet another mysteriously missing article of clothing. Somehow, at the end of the night, everything settled down. A decadent spread of appetizers, meats and desserts awaited us, a feast to fuel the busy night ahead of games, skits, songs and dancing. On this night Russians feel united in their love for celebration and food, laughter and stories, a good tale over a cold shot. As an adult, I try and recreate that magic that I felt as a kid on New Year's Eve. But alas, that tingle in the stomach is unique to a child's soul and cannot be re-created but instead will hopefully be reincarnated – a wish for my own future children, a hope that they will enjoy this amazing holiday as I once did. I hope my little ones will tail me around the house as I crazily rush around putting the finishing touches on my lipstick and desserts. 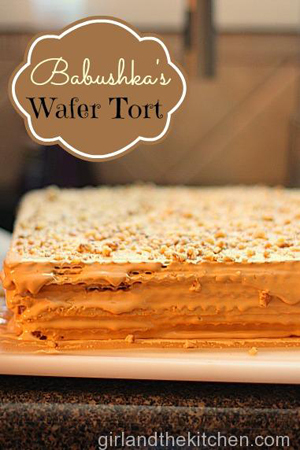 To this day I still make babushka's special wafer tort for New Year's Eve. It's a tradition I hope one day I can tell my kids about. 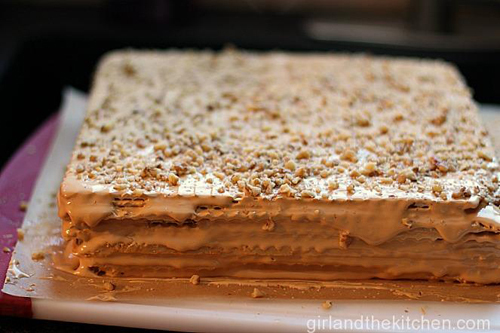 A Happy and sweet New Year to everyone, and with this wafer tort it will be oh so very sweet. 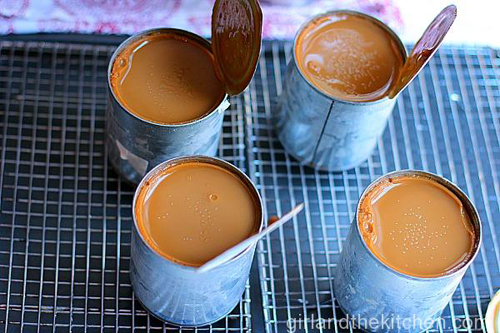 We are going to start with four cans of sweetened condensed milk. Remove the labels of each can and place them in a pot of water, submerging them completely. As you can see in this picture, I clearly forgot to remove the labels and therefore had some unnecessary stickiness on my pot. Boil the cans in the water for 3 hours. When some of the water evaporates continue adding more in so that they are completely submerged. 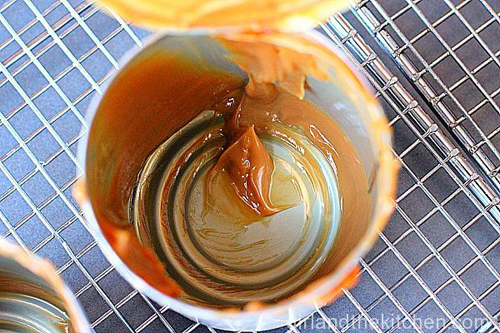 Essentially you are making dulce de leche. And yes I have cheated and bought the dulce de leche but it was not the same, not to mention babushka was upset with me. Next, let the can cool for at least an hour. If you open them now they squirt all over the place and how sweetened condensed milk is not pleasant, not at all. So wait. Once they have cooled, open them up. Scoop them out into a mixing bowl. Do yourself a favor and do not lick the top of the can. I did ... and I have a nice cut on my tongue. And a lisp. But it sure is tempting. Now add the contents of the cans into a mixing bowl along with one stick of melted butter and 3 tablespoons of Cognac or Brandy into the mix. This you can lick and I highly encourage it. You will need two packages of these special wafers. If you have a specialty grocery store nearby you that has Polish and Russian food, they will have these. If not, I can ship you some ... this cake is worth it! You are going to use about 8 of these wafers, which is a package and a half. You can use the rest to dip in Nutella or some of that leftover condensed milk. 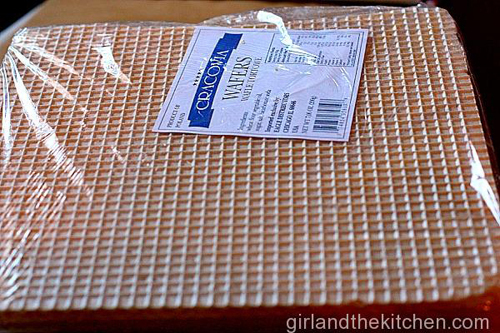 Take a wafer and put it on a cake stand or a large cutting board with a piece of parchment paper underneath. Add about a 2-oz. ladle of cream onto the waffle and smooth out with a spatula as if you were icing a cake. Babushka also used to sprinkle each wafer layer with Cognac, but there were suddenly some drunk children walking around (ahem, me), not that it's a bad thing … it does however, make the layers a bit softer. I tend to like them with some texture to it. 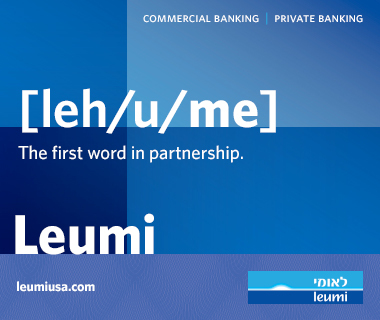 Up to you. Sprinkle on some walnuts onto the top layer and let it rest for a few hours. Slice with a serrated knife and enjoy! Happy New Year! 1. 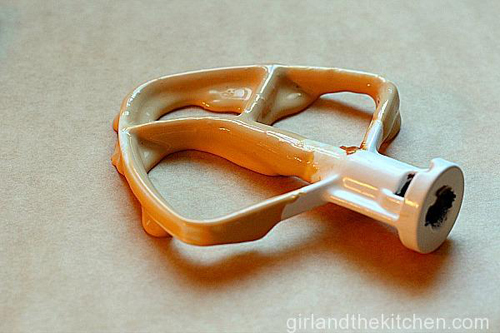 Remove all the labels from the cans of condensed milk. 2. 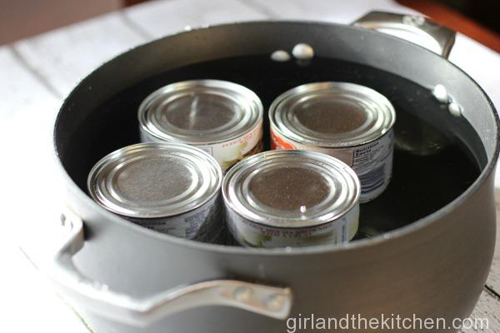 Place the cans in a large pot and cover with water. Boil the cans for 3 hours, making sure to refill the water in the pot as it boils out. 3. Let the cans stand for 2-3 hours or until they are cool. 4. 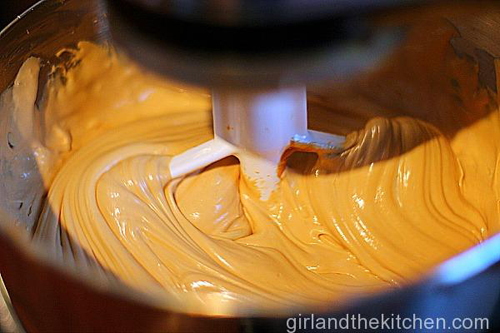 Add the butter and Cognac to the condensed cream. 5. Combine all the ingredients together in a standing mixer with a paddle attachment. 6. 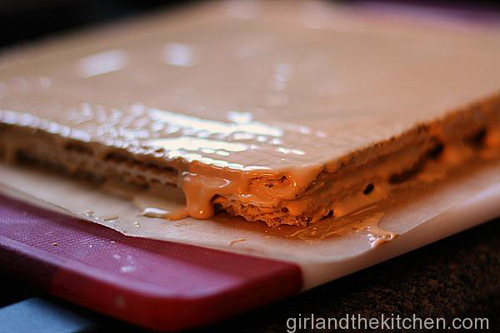 Alternate wafer layers with the condensed milk. Sprinkle the reserved walnuts on the top of the cake. 7. 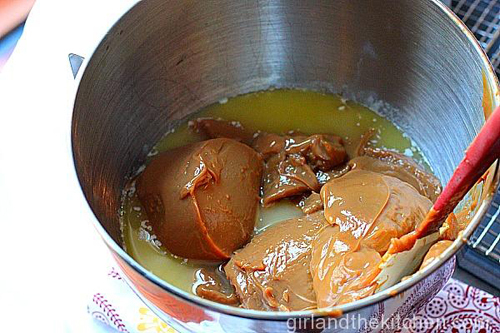 Allow to stand for at least 6 hours at room temperature before serving.